From highly modified restomods to tuned pickups, Chevrolet has over 20 custom vehicles at this year’sSEMA Show. Given the popularity of the Camaro in the aftermarket, it’s no surprise that the new, sixth-generation model gets in on that act with four modified examples. Thanks to a combination of concept parts and components on the way in early 2016, Chevy gives future owners an idea of what’s possible for their new coupe. Among the group are two takes on the SS trim at opposite ends of the color spectrum. The Chevrolet Performance version is Summit White with red accents, and it uses a lowered suspension to hunker the body over conceptual 20-inch wheels. 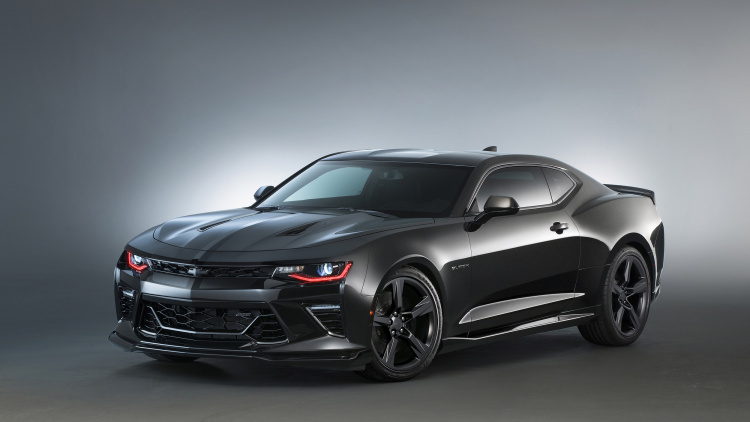 Alternatively, the Camaro Black wears darkened trim, tinted glass, and matching 20-inch wheels. Chevy beefs up their performance to fit the added style by equipping both customs with exhaust, air intake, and brake upgrades. By far the weirdest among Chevy’s group of modded Camaros is the Krypton concept in a custom shade of eye-popping green. This wild paint is electroluminescent, and when the system is activated, illuminated bowties appear across the body. Headlights with matching trim and painted exhaust tips finish off this alien aesthetic. Finally, the Camaro Hyper concept is for those looking for just a little added style for their coupe. Based on the LT trim with the 3.6-liter V6, it features Hyper Blue Metallic paint with white stripes and rides on 20-inch wheels. For a little added performance, coupe uses Chevy’s aftermarket exhaust and a lowered suspension.